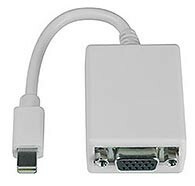 The DisplayPort to VGA Converter changes your computer's digital DisplayPort signal to analog VGA video. The converter generates all the compatible digital to analog conversion signals to make the connection between the DisplayPort input and the VGA output work. 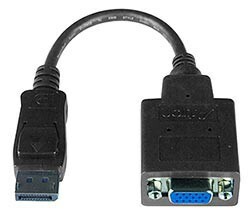 The DisplayPort to VGA Converter changes your computer's digital DisplayPort signal to analog VGA video. The converter generates all of the compatible digital to analog conversion signals to make the connection between the DisplayPort input and the VGA output work. Supports computer resolutions to 1920x1200 and HDTV resolutions to 1080p. Compliant with DisplayPort 1.1 standards.